The Washington-based Republican Party has reverted to isolationist tendencies that are harmful to U.S. national security. This variant of isolationism is very different than the kind the Grand Old Party practiced during the years between the First and Second World War, but it has the same practical effect of distancing the United States from its international partners. Back in the 1920s and 1930s, senior figures in the Republican Party sought to keep the United States away from Europe’s troubles by opposing military preparedness measures. Now, many Republican Senators and Representatives are all for beefing up defense spending and inserting U.S. forces into trouble spots – while eschewing the value of diplomacy. This instinct has been highlighted on the Iran deal. Military options and diplomacy are both needed for hard cases. Favoring the former while disparaging the latter constitutes a new form of isolationism, creating growing distances between Washington and most of America’s friends and allies who value diplomatic settlements over kinetic options. Washington’s advice against entangling alliances made some sense for a new Republic 220 years ago, although his successors found foreign help as useful as General Washington did when dealing with more powerful states. Once the United States became a world power at the turn of the next century, isolationism ceased to serve U.S. national-security interests. But this was a hard sell after the carnage of the First World War as Germany and Japan prepared for war in the 1930s. In 1940, President Franklin Delano Roosevelt recruited two internationally-minded Republicans – Henry L. Stimson and Frank Knox – to serve as his Secretaries of War and the Navy. Part of their job descriptions was to help persuade Republicans on Capitol Hill to slough off their isolationist tendencies and to prepare the country for the likelihood of war in Europe and the Pacific. A crucial test came in 1941, with the need to renew the 1940 Selective Training and Service Act. The original Act limited tours of duty for new recruits to twelve months. The Congress also prohibited draftees from serving outside of the Western Hemisphere, with the exception of U.S. possessions abroad. Geoffrey Wilson of Ploughshares helped me with research on how FDR and his allies on Capitol Hill barely won the battle to extend the draft by a single vote in the House of Representatives. 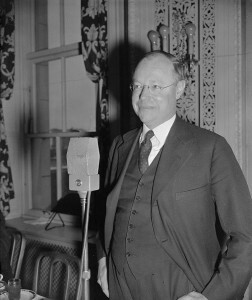 Capitol Hill was then a bulwark of Republican isolationism, led by Senators Robert A. Taft of Ohio, Gerald Nye of North Dakota, and Hiram Johnson of California. Republican isolationists drew strength from some Democrats, religious and labor leaders, and Progressives who wanted to remain focused on domestic needs. On August 12th, less than four months before the Japanese attack on Pearl Harbor, the U.S. House of Representatives voted to extend the draft. The tally was 210-209 when House Speaker Sam Rayburn banged his gavel to end the voting before latecomers and vote-switchers could reverse this result. After the Second World War, isolationism was defeated as soundly as Germany and Japan. Republicans joined Democrats in building institutions for U.S. international engagement. When the Cold War descended on a divided Europe, the formation of purposefully entangling alliances received bipartisan support. The advent of the Bomb also prompted more domestic cohesion than division. Agreements with “the Communist menace” to contain nuclear testing and the arms race also began with bipartisan support. Only eight Republicans voted against the 1963 Limited Test Ban Treaty negotiated in the Kennedy administration; only one Conservative Republican Senator voted against the Anti-Ballistic Missile Treaty. Beginning in the 1970s, this bipartisan coalition frayed badly. The Clinton Administration’s efforts to secure the Senate’s consent to ratify the Comprehensive Test Ban Treaty were rejected. The ABM Treaty lasted three decades before the George W. Bush Administration announced U.S. withdrawal. Arms reduction treaties gained bipartisan support during the Reagan and Bush Administrations, but these lopsided votes reflected the Soviet Union’s decline and dissolution. Republican disaffection returned when Vladimir Putin moved to regain lost ground. A national consensus following the 9/11 attacks on U.S. soil was quickly dissipated, unlike the domestic response to Pearl Harbor. The end of the Cold War and the dissolution of the Soviet Union made it easier for the United States to intervene in Afghanistan and Iraq; when these wars proved unworthy of the immense sacrifices made, domestic divisions grew. Most Republicans on Capitol Hill believed that better outcomes could be secured with greater investments in the use of force, while most Democrats became wary of risking even more U.S. blood and treasure. Meanwhile, redistricting, gerrymandering, and unlimited campaign cash produced a record number of one-party districts and record levels of partisanship. Foreign and national security policy is hamstrung by partisanship, which is why President Obama has opted for executive agreements and other workarounds, like the Iran deal. His successors will, too. Conventional wisdom holds that a Republican President will return the GOP back to its moorings of diplomatic engagement and deal-making, but I have my doubts. Not one Republican Senator was ready to support the Iran deal and majorities of the Republican caucus in the House and Senate are implacably opposed to agreements that constrain U.S. nuclear capabilities. A future Republican President will therefore be beholden to Democratic support – if he or she wants to negotiate agreements with bad actors and can recruit senior officials who are so inclined. This won’t be easy: Those waiting in line for Cabinet positions and to become under- and assistant secretaries in a future Republican administration have built their careers fighting U.S. deal-making. There is no Paul Nitze, Brent Scowcroft, or George Shultz waiting in the wings. The Washington D.C.-based Republican Party has lost its way, just as it did in the 1920s and 1930s. Most, but not all, Republicans on Capitol Hill are instinctively against diplomatic engagement in hard cases, and are inclined to rely on military force to improve outcomes. Without the preference for diplomacy over force, U.S. leadership is not sustainable. An unbalanced approach that denigrates deal-making separates the United States from almost all of its friends and allies – just like the old-fashioned kind of isolationism Republicans practiced between the First and Second World Wars. While you are likely correct that some have lost their way and just despise diplomacy outright or are opposing the Iran deal out of partisanship, I do believe many of them oppose the deal on its merits. I have attended every Congressional hearing on the Iran deal and many members of Congress are pompous and bombastic, but many of them also look at the agreement and think it is not good for US national security. I do not think it comes down to their opposition for diplomacy in general, most were supportive and hopeful of the efforts to negotiate a nuclear deal with Iran, therefore supportive of diplomacy. Being disappointed and opposed to the outcome of diplomacy does not equate eschewing diplomacy in its entirety. Granted the unanimity of the opposition on the Republican side does tend to support your point of view, I am just not comfortable generalizing the party considering it throws the baby out with the bathwater. It dismisses those opposing the JCPOA on intellectual grounds as isolationist radicals just because the most vocal opposition are more content with politicking than governing. If there was a single Republican whose vote against the deal was accompanied by a plausible argument as to how US rejectiion would better serve US interests than the alternative, I haven’t heard of it. Certainly this was not true of my Republican senator (Gardner). And holding out for results not plausibly achievable via negotiation, and inconsistent with the framework of the NNPT, does not constitute support for diplomacy in any meaningful way. I’m not a Republican, but I will give it a shot. Sanctions against Iran were just starting to sting, along with the drop in the price of oil. Holding out would have given the United States more leverage in the negotiations. The President said the sanctions wouldn’t hold, but he wouldn’t use the same argument for sanctions against Russia. We’ve given away enrichment, sanctions, prohibitions on the trade of conventional arms and ballistic missiles, unfrozen tens of billions (which will flow to Russia for arms)…for a promise that Iran won’t develop nuclear weapons and tighter inspections. You have to play hard ball, not softball with Iran. Unfortunately, this is about a political legacy, not preventing Iranian nukes. Read my words in 2015 when Iran secretly deploys nuclear weapons, as the NKs have done. The old isolationists wanted to avoid war by avoiding foreign entanglements. The current Republicans appear intent on courting war by denouncing and demolishing diplomacy. Whatever you want to call it, they are the opposite of “isolationist” – staying out of foreign wars is not what they hanker for. Parties change, and sometimes become their opposites, at least on some issues. For example, Republicans used to support protectionism, but now they support free trade. The Democrats used to favor free trade, but now tend to oppose it. I find that non-cognitive explanations usually work best – it’s a mistake to expect people to have reasons for what they believe, except post-hoc. For better or worse (probably for worse, imo), there’s simply no appetite in the US for making treaties with brown people right now. The Republicans understand that in a way that the Democrats don’t, and maybe the Know-Nothings are the leaders we deserve. I don’t know if that’s xenophobia, isolationism, or just the standard response of a country in times of economic malaise. Do arms-control efforts require some sense of national well-being? Are they more likely to succeed during periods of plenty? Does mutual engagement require the sort of generosity of spirit that only occurs when we perceive an overabundance of resources? It would make evolutionary-psychological sense. You are asking thoughtful questions that merit PhD dissertations. Your line of questioning suggests a direct correlation between national views on immigration and arms control. There is no logic to the agreement if the Iranians are determined to cheat. If there is an agreement and they go for a nuclear bomb, we also threaten to attack. With the deal, the only outcomes favorable to the P 5+1 is less centrifuges, which means less enrichment (unless another Fordo pops up) and better monitoring of the cycle. For this, Iran gets tens of billions unfrozen, sanctions dropped, conventional and ballistic missiles in several years, the right to enrich and develop advanced nuclear technology, etc. It isn’t isolationism…its just this deal is weighted heavily in favor of the Iranian regime. If there is no agreement, then there is no transparency, plus (judging by past behavior) strong motive for Iran to at least appear to be making rapid progress toward a bomb. We won’t be able to know for sure whether Iran is going for a nuclear weapon or not. Do you advocate bombing Iran anyway, with no really good evidence on whether Iran is actually going for a nuclear weapon or not? With an agreement, there are various restrictions on what Iran is allowed to do, plus transparency. With transparency, we have better knowledge on whether Iran is going for a nuclear weapon. In that case it is only necessary to bomb Iran (or snap back sanctions) if we see actual evidence that Iran is going for a nuclear weapon (or simply violating the agreement). With an agreement, Iran is able to assure the U.S. and others that Iran is not going after a nuclear weapon. Therefore, we can all avoid yet another Middle Eastern war. Transparency on nuclear and related activities, and barriers hindering development of a nuclear weapon, are both good aspects of this deal. I don’t believe you are correct. There is a clear logic to having this agreement even if the Iranians are determined to cheat. It is this: the inspection-regime makes it inevitable that the USA will be able to “make the determination” that the Iranians are, indeed, “determined to cheat”. That is a marked improvement, since that is not true now and hasn’t been true since at least 2007. After all, since 2007 the National Intelligence Estimates have consistently said that they can’t detect any sign that the Iranians are “determined to build a nuke”. Under the status-quo that estimation is unlikely to change i.e. the politicians are going to keep shouting that Iran Is Determined To Build A Nuke!, and the spooks are going to keep reporting that While That May Well Be True, We Aren’t Seeing Any Signs Of It. The former isn’t going to change – war-mongers seldom admit that they were wrong – but with this agreement in place then the latter part of the equation will, either for the better (No, You Are Wrong!) or for the worse (Correct, And Here’s Your Proof!). To my mind that alone makes this agreement a worthwhile venture for the United States Of America. War is a serious business. It’s not something carried out on a whim, or a prayer, nor on a suspicion. The Iranians are determined to cheat — you say. Republicans on Capitol Hill are determined to overrule or block or disregard sanctions relief — they say. Would you call that cheating? Actually, MK, I never wrote the Iranians are likely to cheat. However, if their past record is any indication, they will cheat again. Fordo was prohibited. So was research on nuclear weapons designs. Go back ten years on this blog. I predicted nothing would stop NK from producing and testing nuclear weapons, as well as opening Yongbon again to produce more plutonium. Now they are enriching uranium as well. The Iranians have been on a +20 year strategic path to the bomb. A piece of paper with as much teeth as the Munich agreement isn’t going to do much to stop them in the end. It buys time, at most.